Mark Griesbaum mentioned in last week's newsletter about getting uncomfortable to be successful and about the importance of networking. In 2014, I started on a multi-year journey executing a business-driven strategy to transition all IT business systems and their support from internal resources (technology and human) to a cloud-first, managed services IT solution. Talk about being uncomfortable! The cloud was an emerging technology back then, and continues to mature today. There were not many companies making such a commitment to jump to the cloud at the time. And the company was never on the bleeding edge of technology. As a matter of fact, we were replacing some rather ancient technology. I knew when the journey started I could either jump ship like many others within the IT organization did. Or I could see it through and have a great success story to tell at the end of the journey. I chose to see it through. Recently I completed the transition. And while I learned all about the business and built many important relationships with employees, suppliers and customers, the journey was uncomfortable at times; but extremely successful! I am now relying on the power of my network to present my next success journey. In 2008, I joined SIM Chicago. I have been an active member in the organization as well as a board member. Many of the relationships I developed through SIM Chicago came in handy during the cloud-first journey. What I did not know was that I could reach out to several SIM Chicago members within the network to bounce ideas, learn about industry best practices or simply to check my sanity. Developing and nurturing relationships plays a key role in my success strategy. My experiences are an excellent example of power of networking and a great success story! If you are interested in hearing more about this cloud journey and success story feel free to reach out to me. The SIM Chicago Fall Gala is just around the corner. Plan to spend an evening with many of your colleagues, myself included, as well as spending an evening with Mike Rogers. Mike is a retired Admiral, US Navy. Mike will share lessons he learned during his 37 years in various leadership roles; most recently head of the National Security Agency (NSA). Click here to register for an evening of learning and relationships. I hope to see you at the Gala! Over this past year, I've written SIM Newsletters about the idea of "Getting UNCOMFORTABLE to be Successful", and about the importance of "Networking". This year my message to all our SIM Chicago Chapter members is about developing our next generation of leaders. It is our responsibility to provide the experiences, coaching and mentoring to our "High Potential" staff so that they can help us solve even more complex business issues that will face all of us in the near and distant future. Technology is used by every single worker across the world today. Tell me who can now do their job without technology? Nobody! The world depends on technology and figuring out how to continue to improve the operations of their company which will in turn provide the best products and services to their customers. This will take strong leaders within IT and the business working hand-in-hand to figure this out for their particular organization. It is all of our responsibility to develop the talent and leadership that will be prepared for the future. I can think of no better investment in your high potential staff, but the experience they will gain from the SIM RLF Leadership Program. There are now over 5,000 graduates of the Program across the country over the past 25 years. This year we had our largest class in the Midwest Forum with a total of 52 people thanks to our Chicago Chapter's support. Our class had participants from 22 companies across 9 Midwest and eastern states. Our class also is very diverse with 37% women, and more than 1/3rd being born outside the U.S. This diversity is very beneficial to the learning these individuals are afforded, and hopefully indicates the diversity within your own teams. This opportunity is providing each person with 51 peers whom they can now "network" with for the remainder of their careers. Each peer has provided them with incredible and valuable insights into their strengths and areas for improvement as they seek to become stronger leaders in business and family life. Our next Class will begin in March, 2019 through October. It will be held at the Lincolnshire Marriott this next program year. Please consider sending one of your leaders to this Program. The RLF Program is a Life Changing Experience!! As the cybersecurity threat landscape continues to grow increasingly complex, it's imperative the relationship between the CIO and CISO be one of interdependent partnership. In a number of organizations the CIO and CISO are often viewed having dissimilar mindsets, complicated with conflicting priorities. As digital technology continues to transform businesses across industries, the role of the digital CIO is also transforming and growing in importance shifting their focus from IT delivery towards business leadership. These new technologies and processes increasingly expand the risk footprint and security challenges of organizations. The role of the CISO has also matured over the years, the position evolving to include the landscape of the entire organization as cybersecurity is now recognized as a business problem not an IT issue. One of the most critical relationships in business today is that between the CIO and CISO. The key outputs of their collaboration enables innovation without compromising data security. By emphasizing transparency, communication and aligning on business outcomes both leaders can drive value with people, process and technology. The Chicago-area Chief Information Security Officer (CISO) of the Year Program now in its 6th year, in association with the Chicago chapters of the Society for Information Management (SIM), the Association of Information Technology Professionals (AITP), ISACA, FBI-InfraGard, and Information Systems Security Association (ISSA) is proud to announce Mr. Nicholas Percoco and Mr. Bradley Schaufenbuel as the finalists for the 2018 Chicago-area Chief Information Security Officer (CISO) of the Year award. Designed to recognize the significance of how information security plays into the local and global business community, the nominations, judges and support come from the Chicagoland CISO community. The winner is determined through a three-phase process that began with an extensive written submission by the nominees that detailed their leadership approach and achievements over the prior year. Over a three-month period, the nominees were interviewed and scored by a panel of their peers. Two finalists are then submitted to program judges Mr. Jason Montrie (President, Pareto Intelligence) and Ms. Sharon O'Keefe (CEO, UChicago Medicine) for final consideration. Do you and your company drive people to be Bystanders or Upstanders? Being an Upstander very often means standing alone, which takes guts, writes Jennifer Merritt, Editor in Chief, Digital at PwC. "Most people are Bystanders--not because they don't want to stand up, but because they're afraid to speak up, afraid of repercussions, don't observe the world around them enough, or simply because they don't know what to do or say in the moment. To be an Upstander among Bystanders takes courage and conviction." Today's CIO's and their senior IT leadership are expected to be leaders in their organizations: to be Upstanders, not Bystanders. We are at the epicenter of nearly all corporate activity and we are uniquely positioned to provide value in ways that individual departments are not. We are responsible for the automating and integrating of business process across the enterprise, and in that role we should be seeing opportunities to positively impact our businesses in both small and large ways. What have you recently done to help your company? SIM Chicago provides a professional network of senior technology executives who are travelling the same path you are travelling. Join us as a member if you are an IT executive practitioner and are not already a member, and if you are already a member, be sure to participate in SIM Chicago's events to meet your peers and so that we can all be more effective across the entirety of the Chicagoland technology community. Upcoming events include SIM's invite-only CIO Executive Roundtable on Friday September 28, and SIM's Annual Fall Gala that is open to members and non-members on Tuesday October 16 at the Union League Club of Chicago. I hope to see you at a SIM Chicago event soon. As summer comes to a close, and kids are going back to school, we at SIM Chicago are as always excited to see so many of our amazing colleagues and friends again as we learn and grow together. We were happy to once again offer some opportunities to unwind and get to know each other on a personal level this summer at Ravinia where we heard the legendary Buddy Guy and at White Eagle Country Club where we again raised over $40k to support ic stars. Our program year once again is designed to strengthen our community and help our members be the best leaders possible in these challenging times. From our CIO breakfasts to our galas to our philanthropic events to our socials, our board works tirelessly to serve our members who are so talented and dedicated to their profession and community. 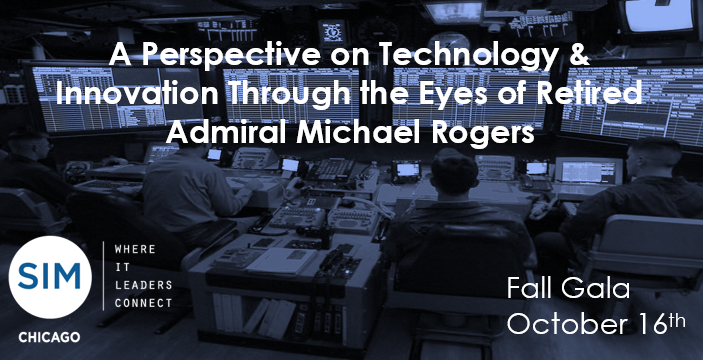 I am particularly excited to have Admiral Michael Rogers, USN (retired) and Former Commander U.S. Cyber Command/Director, National Security Agency, as our keynote speaker for our fall gala at the historic Union League Club on Tuesday, October 16th. But beyond our programming, it's really the community itself that I value most. Life throws us curveballs, and as a kid that hung up his baseball cleats when pitchers learned to throw these things, I know it can be challenging. I had the opportunity to have drinks with a longtime friend and SIM member last week that has had some of these challenges, and reminded me that it's this amazing support network that helps us to overcome these hurdles both personally and professionally. Maybe if I were a SIM member at age 12, I'd have learned to hit that curveball. I do believe I can now, thanks to so many of you. It's time to go back to school. It's time for meaningful baseball. It's time to change the game. Thank you all for being such valued members of SIM. Play ball! Summer is here and I notice it as my children keep counting down the schooldays they have left and as a family we are making plans for the Summer. The last several days have been really good and if that is a promise of our Summer, I like it. What a SIM Chicago season we have had thus far. Many very well attended events, with a broad spectrum of topics and a terrific selection of speakers and facilitators. I personally always like the different venues we chose - you get to see new and different workspaces and when there, meet leaders who create a real culture of digital and innovation. If you have not experienced that yet, please reach out and we can together plan for your attendance. What is coming to you this Summer is a set of real good and social events. In partnership with the Executives Club of Chicago, we will present the CIO of the Year award on June 20th. And after that, we will host our Summer social event, at Ravinia on July 8th with Buddy Guy and Jonny Lang. That promises to be a wonderful informal evening. And last but not least our SIM Chicago Golf Outing on July 30th at White Eagle Golf Club. Now, that is an event that you have to attend - you will meet many peers and colleagues in our community, have a day to connect, network and have fun while contributing to a large give back to IC Stars. As you can see, we got you covered for the Summer. All three are great opportunities to stay connected to our community! Currently, the SIM Chicago team is working on next season's planning and we hope and count on seeing and meeting you at our events. And remember, SIM Chicago, where IT Leaders connect. One of the principles of SIM Chicago of which I am most proud, is the chapter's commitment to community. Every year we raise money for charitable organizations, as well as, donate time and energy. This past Tuesday I had the pleasure of attending the benefit event, Capitalize on Illinois hosted by i.c. stars. The event was truly inspiring. It brought together Chicago area high tech leaders to discuss global economic forces affecting the local IT workforce and this year the focus was on cyber security. In addition to the fantastic networking and great presenters, we got to meet the next class of young IT talent working their way through their unique training program. Hearing their stories and seeing what they've accomplished reminded me of how important investing in our community is to the long term success of Chicago's economy. At SIM Chicago, we believe in this principle. We understand that the power of SIM Chicago can reach beyond networking events and creating connections, but to also invest in the future. After all, if you want to know where the future of technology is going, you need to look at where the kids are today. Our annual Golf Outing is fast approaching on July 30th. Every year we host this event to raise money for i.c. stars. The donation provides opportunities for young talented individuals to better themselves, their communities, and ultimately to join our workforces. This is one of our most popular events, so please register soon. If you know of businesses that would like to also invest in the future workforce of Chicago, please encourage them to be a sponsor. The strength of SIM Chicago can be seen in the power of our partnerships and extensive network. SIM Chicago is once again partnering with the Executives' Club of Chicago and the Association of IT Professionals to honor the CIO of the Year on June 20th at the luncheon program at the Palmer House Hilton an annual award recognizing the outstanding work of Chicagoland CIOs since 1996. We recently joined our fellow CIO's and CFO's from Finance Executives International to talk about cybercrime with the State of Illinois, the Secret Service, Gartner and others. We will be supporting ic stars at the end of July with our annual golf outing fundraiser. And Chicago Innovation is once again accepting nominations for their annual awards. I recently had the honor to speak both at the DePaul University and at TLA (Technology Leadership Association) - two local organizations that are preparing people for a new, or next career. All of these partnerships create a fabric of networks that are interconnected and strengthened by one another. We at SIM Chicago believe in partnership. We believe in connections. We join together with like-minded locally focused organizations to exponentially add value for our members and our community. Because together, with the right focus and shared values, we can do more. We are proud of this unique ecosystem that has been fostered through years of collaboration. Not only does this spirit of partnership strengthen our respective organizations, I believe it can be a model for all of us as individuals and as organizations. As individuals, what relationships do you foster to exponentially increase your own impact? As organizations, what like-minded organizations can you partner with to create new value streams? It's not always easy to partner. It can be complex. You will need to be vulnerable, maybe even cede some control. But in the end, you will build a stronger, more sustainable competitive advantage and accelerate personal and organizational growth. We are glad that you've joined our SIM Chicago network, the premier network of executive technology leaders. We hope and believe that it will open up doors for you and your organization maybe even in surprising and unexpected ways. We encourage you to continue to strengthen and grow that network by referring other strong technology and business leaders, attending our compelling schedule of events, and triggering that virtual network effect. GE recently hit the headlines with performance issues in trying to become a "digital industrial" company, its leadership accused of whitewashing the facts. Nike cut back by half its investment in its digital unit, discontinuing its activity tracker and other investments. Lego stopped funding its Digital Designer virtual building program. What happened? How did experienced leaders take these large companies to a landscape of digital dreams delayed? As Simon Sinek wrote, we "Start with Why". With typical strategic change, leaders are usually clear about what needs to be accomplished and the tactics it takes to get there. Team members understand and invest in the hard work and heavy lift needed, and progress can be measured. When signals and indicators veer off, course corrections are made. However, research indicates there is something different about digital change that causes leaders in large, well-established organizations to misplace their balanced decision making approaches. 1) Clear messaging. Digital technology should not be viewed by leaders as a salvation. Leaders need to clearly communicate and articulate the vision, mission and goals of the strategic change. Teams told to "go innovate" often times get lost with the direction to take. 2) People create and sustain change. Digital transformation is not plug-and-play. It requires investment in people, skills, plans, infrastructure and re-tooling IT systems. Focusing on the new technology without tightly integrating the human element often times leads to failure. 3) Timing. Digital investments should be tied to consumer and industry readiness. There are many examples of companies who created innovative products and services ahead of their time, only to be re-engineered and released at a later time when the markets were right. 4) Avoid ripping out what works. When things are not working, implementing new and innovative business models can be incredibly appealing. The attraction of something new can cause leaders to forego much needed attention to upgrading and adapting existing processes and empowering people. Finding a balanced approach to something old and something new builds foundational stability for the upcoming challenges. Changing an organization's culture is not easy. However, the ingredients to the recipe is not a secret either. Foster a culture of sustainable change by sharing stories and insights with your fellow SIM members. An easy way to stay current in this age of acceleration is to get more involved with upcoming SIM events. Join us on Thursday, April 19th at the Union League Club in Chicago for a partnered event by SIM Chicago and Finance Executive International (FEI) for an opportunity to discuss Cybersecurity and network with your IT peers and Finance executives in the Chicagoland area. It will be a great opportunity to network with the SIM and FEI membership as well.